The main focus for our blog is to pass on information and tips about growing food using Permaculture methods, to help vegetable garden owners take responsibility for their garden and their own backyards allowing them to supplement their diet with real whole foods grown by themselves in a fully supported and natural way. Wicking beds are self watering garden beds. Wicking bed has a water reservoir that sits underneath the soil your vegies grow in. To create a wicking bed you need a waterproof container or a garden bed frame that can be made waterproof. 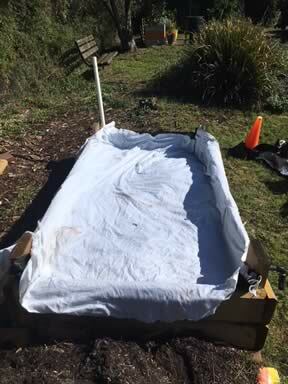 Wicking beds can be created in corrugated metal beds, wine barrels, large fruit crates, plastic tubs, build with hardwood timber sleepers or untreated golden cypress timber sleepers. If the container isn’t waterproof it will need lining. Lining materials include builders plastic or polyethylene that is 0.5mm thick. Old carpet or thick sheets of cardboard can be placed underneath garden bed which will help prevent punctures. The bottom section of the garden bed the reservoir is filled with pebbles like scoria or blue metal. Then geotextile fabric is placed on top of the pebbles. This is the barrier between the reservoir and the top area of soil. The geotextile fabric allows water to penetrate and this results in capillary action. Watering from the bottom up. The fabric will stop the soil from filtering into the reservoir. A pipe is setup at the top of the bed and this pipe passes down into the bottom reservoir. This is how water is filled into the wicking bed. Also a hole is drilled into the side of the wicking bed where the reservoir and soil meet. A pipe is fitted into hole and this becomes the overflow pipe. Thus water then does not saturate the soil section. Capillary action will water the vegies. See Gardening Australia web site, for more information on Wicking beds. See Very Edible Garderns website, on Wicking beds. 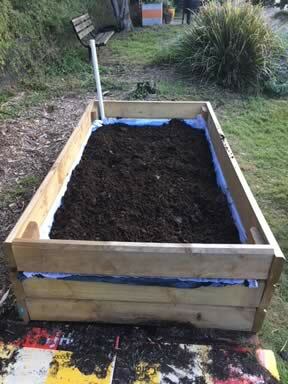 Photo’s of wicking beds are from Edgeworth David community garden and the Fagan park eco garden..
Raised vegetable gardens can be made to a height of 1 metre to 1.5 metres usually to waist height. These raised beds allow gardeners to work at a comfortable height without having to bend over and work at ground level. They can be made of timber or recycled bricks / materials and filled with good soil and compost. Their ideal for wheel chair access and they can be netted by placing stakes at each corner and then placing a net over the bed to keep out pest insects and wildlife. An assortment of herbs and vegetables can be grown in them. Wicking beds are raised garden beds that are self watering. They hold water below the soil and water is sucked up by the plants roots through capillary action when it’s needed. The base of a wicker bed is lined with a pond liner then on top of pond liner porous rubble is placed. Placed in the middle of the rubble is an agricultural line ( Ag pipe ) which zig zags through the rubble and is connected to a PVC pipe which extends to the top of the raised bed. This PVC pipe is filled with water which flows into the Ag line in the lower area of the bed. On top of the rubble geotextile fabric is placed with the soil placed on top of that. An overflow outlet pipe is placed at the point where the soil meets the geotextile fabric. Wicker beds are great during dry period and summer as they are self watering. Edgeworth David community garden, Hornsby. The Edgeworth David community garden is a work in progress. The garden is evolving with fruit trees, vegetable gardens, a swale ( a drain that slows down rain runoff ), compost bins, worm farms, tool shed and a place where people can come to together to grow food. These pictures are of Volunteers from Catholic care centre for people with a disability working in the garden. The volunteers work each Thursday for a few hours. Recent projects involved planting potatoes and late season winter vegetables. Each week the team waters the vegie gardens, add food to composts and collect food harvest from the garden. "We’re thoroughly enjoying our work in the community garden. Jim is a great mentor and an absolute legend!" If you live in a unit with a balcony or a town house with a small court yard you can still grow herbs, vegies and fruit. Pots and polystyrene boxes can be used in small spaces. With a little sunshine and premium potting mix an assortment of plants can be grown. With the polystyrene box make some holes in the base of the boxes to allow for drainage. Put some stones / pebbles in the holes of the pots and the base of boxes so the water may drain without soil leaching. Purchase quality potting mix like pot n peat. Healthy soil = healthy plants. Pots and boxes can be placed on feet for pots or garden / pot plant shelves. Once you have all the materials plant out seasonal herbs and vegies, add colour with annuals and flowering plants. These flowering plants will attract good insects and pollinators. Dwarf fruit trees can be grown in pots. Climbers like beans, peas and passionfruit can be grown around vertical balcony railings. Worm farms can be used as they are clean and are self contained. Worm farms will take care of kitchen scraps and provide liquid fertiliser. Even a small pond can be created by using a medium to large pot which does not have a drainage hole. Fill with water add some aquatic plants, grow some water chestnut, keep native rainbow fish. The aquatic plants will act as filters and the rainbow fish will eat mosquito lava. A small space can be made into a beautiful productive area. Vegie patch - If your home vegie patch has been overrun by weeds, there are a few ways of renewing it. Pull out all the weeds and plant a winter green manure crop. Green manure crop is made up of a mixture of seeds like oats ,lupins, rye corn and dun peas. Green manure will grow over winter, it will crowd out weeds and when dug back into the soil in early spring will provide nutrient to the earth. Green manure can be purchased on line, see Green Patch if you live in NSW or the ACT or see Green harvest if you live in Queensland. Either pullout all the weeds or leave the weeds and cover with sheets of damp newspaper. If you leave the weeds in the patch use extra sheets of newspaper. The paper acts as a weed mat. Then place down a layer of mulch this can be Lucerne or sugar cane mulch. You can allow the patch to rest over winter or plant winter vegetables and winter annuals. If it’s to be the latter place soil over the layer of mulch / Lucerne and mix soil with compost, cow manure, blood and bone, and chicken pellets. Then place another layer of Lucerne over the top of the soil mix. When planting vegies and flowers make a hole in the Lucerne, drop some soil into the hole and plant your seedlings. Then spread Lucerne around the base of plantings. This is called a No dig garden. for more information on No dig gardens . Let them rest over winter, you could try green manure or just mulch with newspaper and Lucerne. In summer try leafy greens like Asian greens, all types of lettuce, Spinach, Silverbeet, some chillies and bananas. For more information on Winter vegetables and flowers. Native stingless bees as the name suggests - don’t sting. Australia has many types of native bees. Native bees can be encouraged into a garden by planting lots of colourful flowering plants. Like the European honey bee which we are all familiar with, bees love and are attracted by beautiful colourful smelling flowers. As the bees roam from flower to flower / plant to plant collecting nectar, they are providing pollination for the flowers. Pollination of flowers aids reproduction as well as the formation of fruit. The more bees present in the garden the more likely there will be a increase in fruit forming. For example when citrus trees flower the presence of bees will increase the formation of fruit. Thus plant lots of colourful shrubs around your citrus trees and other fruiting trees. Native stingless bees are either solitary or they live in a colony. Most are solitary. The solitary bees include the Blue banded bee which has beautiful blue and black strips which I have seen in Canberra and Sydney. Other native solitary bees include the Tiger bee, Teddy bear bee, Gold tipped leafcutter bee all seen in Sydney. There are only 2 types of native bees that live in colonies. Carbonaria stingless bees are found from the South Coast of NSW to Northern Queensland and can be found naturally in the Sydney region. 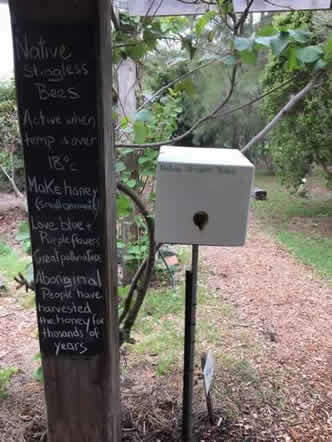 These bees can also be kept in the home garden in a purchased hive or can be naturally encouraged with the planting of native flowering trees and plants. They love blue and purple flowers. 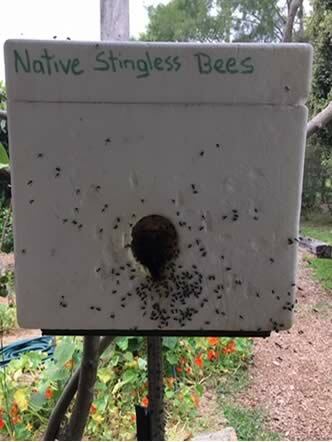 Native bees hives set up in a community garden or a home garden need to be sheltered from the afternoon summer sun. They are active and come out of the hive when the temperature is 18 degrees and above. In winter they are less active. Ideal temperature range is 18 to 40 degrees. Above 40 degrees place a wet towel over the hive to aid with cooling. When the temperature range is in the 20’s and 30 ‘s you will see lots of bee active around the hive and in the garden. Sometimes it’s great to sit by the hive with a cup of tea and watch the native bee activity. Native Australian people have harvested the honey from Native bees for thousands of years. The honey is used as a sweetener or eaten straight as a treat. The hot summer days are now fading away and cooler darker morning and evening are slowly beginning. Time to harvest the last of the summer fruits and vegetables. Lots of autumn jobs to undertake. After the last of the summer vegies have been harvested it’s time to add organic matter to the soil. Compost, blood and bone, organic pellets will improve soils, remember to rotate the new autumn crops. Where legumes ( plants with pods ) pea’s / beans were grown in summer plant leafy greens like lettuce and spinach in autumn. The leafy greens will use the nitrogen that the legumes released into the soil during the summer growing period which helps to produce foliage. Add organic liquid fertiliser when planting new seedlings. In the citrus garden the fruit trees will have lots of green fruit which will start to ripen in May. Continue to apply organic fertiliser every 4 to 6 weeks till the first harvest. Add around the citrus trees chicken pellets, blood and bone with liquid fertiliser. If there is mulch or Lucerne around trees lift up or rake to the edge of tree drip line then place down fertiliser, water in and place back mulch / lucerne around tree. In the orchard it’s time to prune the spring fruiting trees. Generally prune trees into a V or vase shaped tree removing any cross branches that are growing across the centre of the tree. Keeping the centre of the tree free of branches allows for better air flow and allows sunlight into the centre of the tree. Add organic fertiliser and mulch to the base and around the drip lines of the trees. As the deciduous leaves start to fall rake up and add to compost. Leaves, grass clippings and garden waste can be added to outdoor composts and should be turned with a garden fork each week. Food can only be added to enclosed composts and worm farms. Composts provide a great source of fertile soil and worm farms will provide liquid compost. 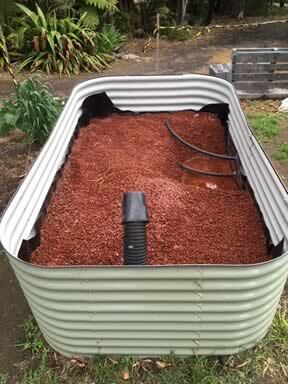 If you live in a unit or town house a worm farm will suit as it is a contained clean compost. Autumn is a good time to apply organic fertiliser to all garden beds and lawns. If you live in a cool climate zone plant out garlic now straight into the earth. Also consider planting a plum tree, there are some low chill varieties. If you live in a temperate zone place garlic in the fridge for a couple of weeks, this will give it the chill it requires and then plant out into the garden. Garlic will take about 6 months, when the leaves begin to die back that’s an indication that its ready for harvest. For additional information on autumn plantings .